Aurae (pronounced aura) recently launched an innovative card program that enables members to create a fully customized, bespoke debit MasterCard made from 18k or 14k solid gold. Aurae combines financial services and luxury jewelry to create elegant works of art for their members. 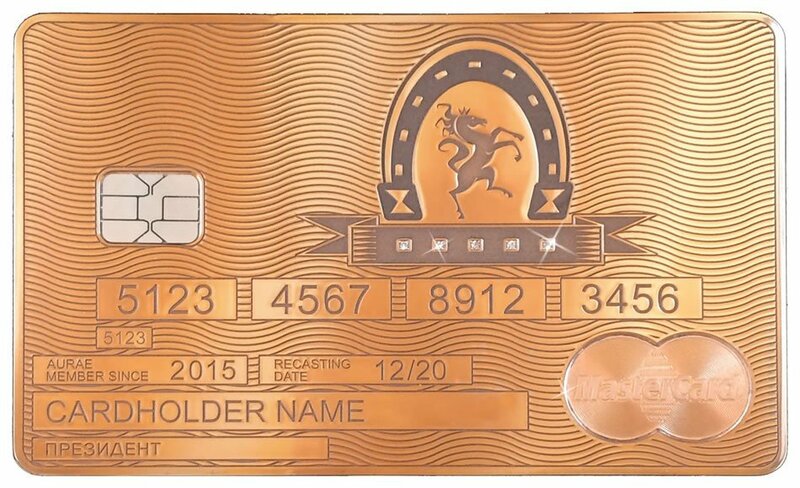 Accompanying members’ one of a kind Solid Gold MasterCard are bespoke concierge and lifestyle management services designed to enhance members’ lifestyles. Aurae is an invitation only membership program based in the United States and sources it’s members globally. 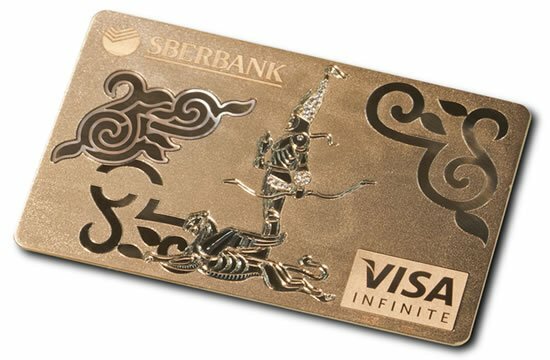 The bespoke card design process and the bespoke lifestyle management program make Aurae extremely unique. Aurae believes that one size does not fit all. As such, Aurae clients work side by side with Aurae designers to design a customized card that is a unique expression of their personal achievement, personal legacy and personal success. “We see our clients create designs around four major passions – their family crest, a personal logo or company brand, self portraits or inspirational art” said Christopher Scanlon, CEO of Aurae. 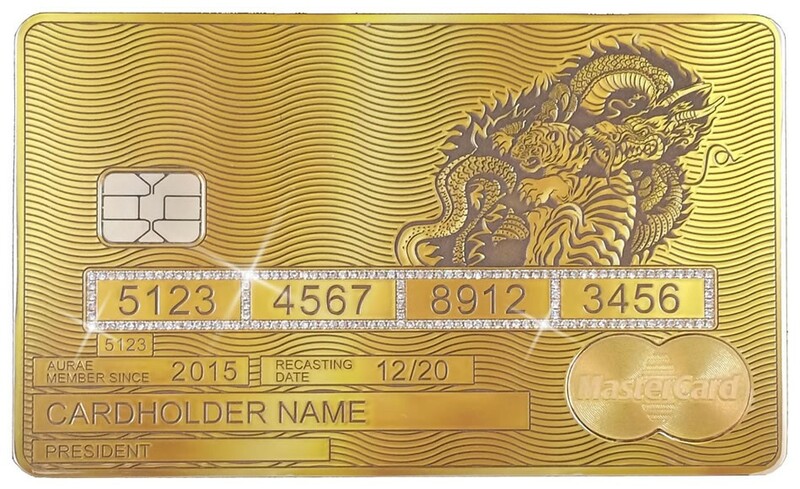 After clients approve their custom design, Aurae’s master jewelers and goldsmiths translate their design into a Solid Gold MasterCard. 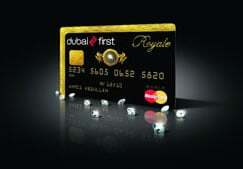 Cards weigh between 45 grams and 60 grams and contain up to 164 1 point precious stones. 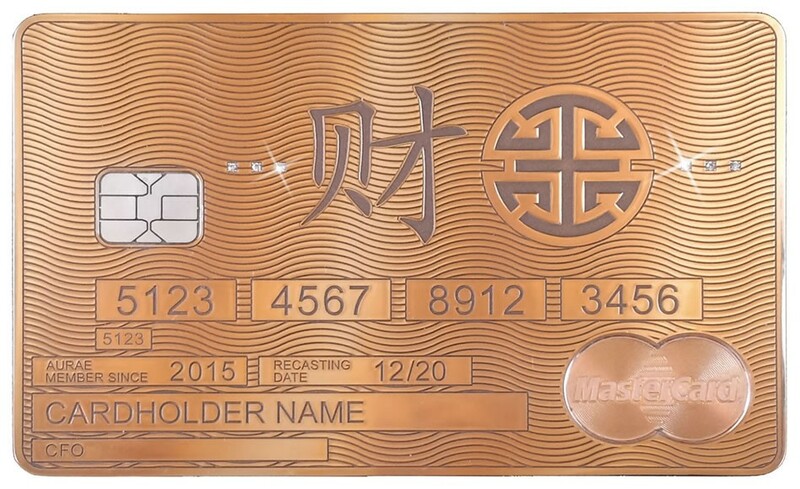 Card numbers, custom designs and client signatures are expertly engraved into the gold for lasting permanence. 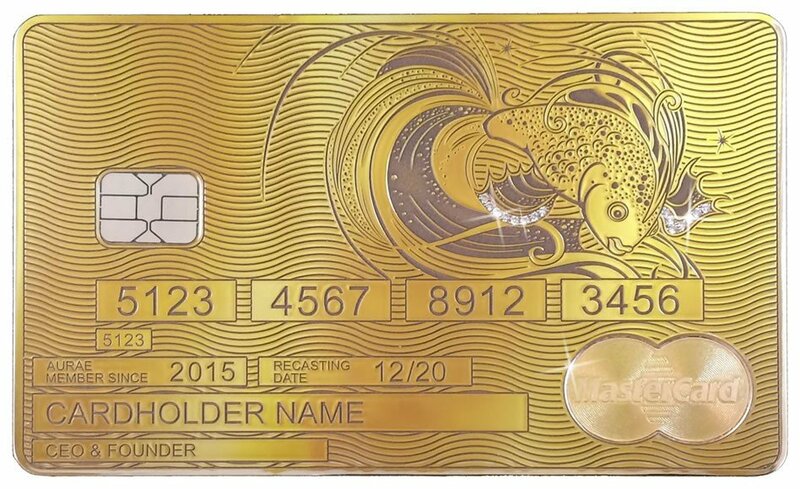 The card is a fully functional payment mechanism as Aurae Solid Gold MasterCards have a magnetic strip and chip/pin technology that is fully compliant with MasterCard standards. 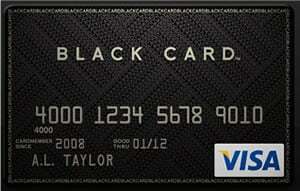 Cards can be used anywhere MasterCard is accepted. 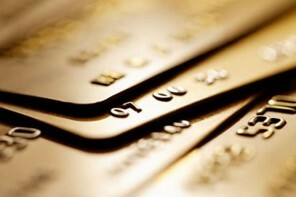 Upon delivery of clients’ Solid Gold MasterCard, Aurae members are automatically enrolled in the Aurae luxury lifestyle and concierge program. Unlike traditional card concierge programs, Aurae members are assigned a Dedicated Lifestyle Curator that is available 24/7 to respond to member requests in over 115 countries worldwide. Mr. Scanlon, a seasoned and serial entrepreneur, started Aurae because many card concierge programs were becoming one size fits all. “At Aurae, we realize our members experience wealth in very different ways. This is why it is critical that everything in our program is bespoke. It provides us with a deeper understanding of our members and it enables us to add real value to their lives. We strive to seamlessly deliver experiences commensurate with our members lifestyle and passions” said Mr. Scanlon. According to Wealth-X, 87% of all newly minted millionaires are self-made. Key to success for all self made millionaires is their ability to manage their time. The Aurae Lifestyle Curators are on a mission to give its members the gift of time by rapidly curating ordinary and extraordinary experiences in an efficient fashion. While the personalized card in itself tells of your success, the way it enhances your lifestyle experiences is sure to exceed your expectations. The card arrives nestled in a hand-crafted, solid maple heirloom marquetry box. Accompanying the box is a certificate of authenticity and a hand-stitched leather wallet with a dedicated pocket for the card. 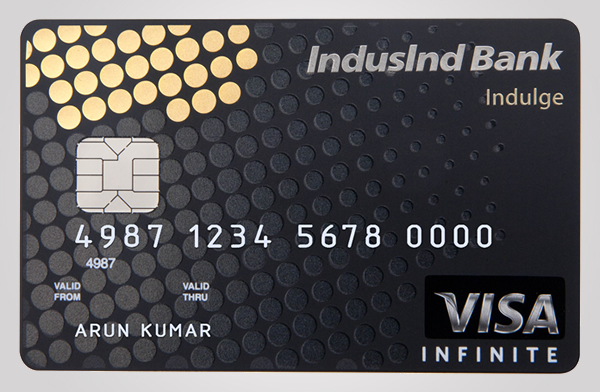 Each card is insured by Lloyd’s of London against loss or theft, providing members with well needed peace of mind. 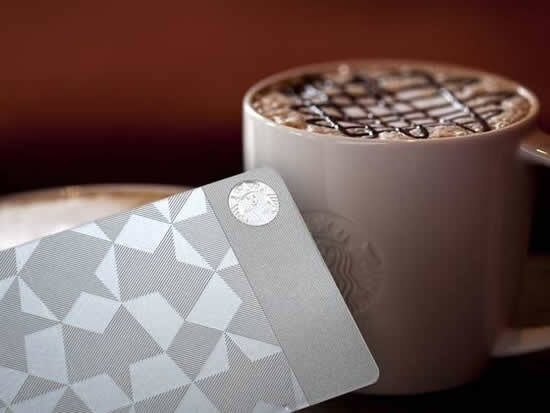 The Aurae Lifestyle Membership Card is available globally by invitation only. You could inquire at www.auraelifestyle.com to understand the eligibility criteria more clearly. 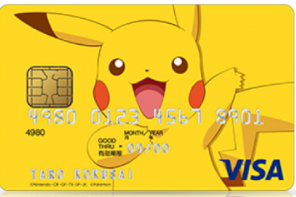 Bespoke memberships begin at $50,000 or £30,000. The annual fee of membership is $5,000 or £3,000. 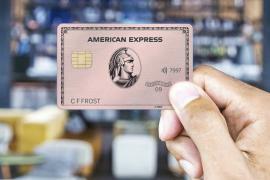 Through the membership you unlock the power of a 24/7 concierge service and an assurance that your gold card will be replaced every five years. 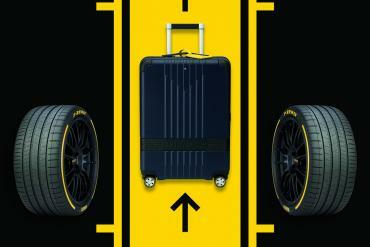 It is truly the indulgence of those who love their lifestyle experiences crafted to suit their eloquent desires.